This page is brand new and currently under construction. 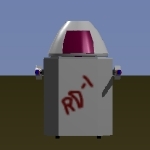 I'm currently working on a prototype Rover Droid in real life, and will be posting information here on my progress. Also will be links of where you can get robotic kits to build your own robots. This will also be the place I list my experiments with the LEGO Mindstorm Robotics Invention System. Feel free to check back later to see this page grow. 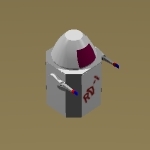 This is a snapshot of the Rover Droid I'm designing right now. 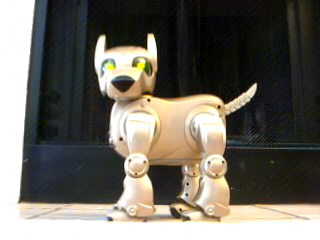 This is my Tekno puppy, at 1st they are fun. But then the reality of this ain't no AIBO or I-Cybie sets in. Meet "Anubis", my I-Cybie. I've had him for awhile now and just never took a picture of him to update this page. Well here he is with his flashing green lights and all. At the moment he is broken down and needs new battries to work again. 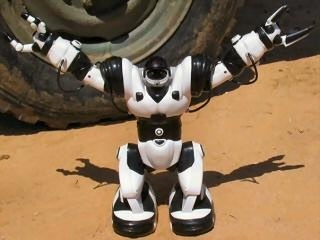 I just hope I can get some soon as this is my coolest robot and most expensive at the moment. Still I think the Sony AIBOs are better after having this robot for awhile now. These guys are cool.. They're Mark Tilden's creations called B.I.O. Bugs. 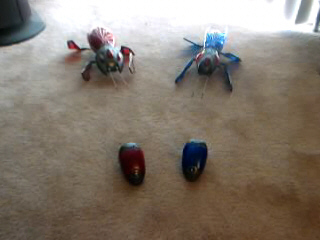 These are really cool and life like, also they have skill levels and can learn, almost like real life pokemons! Those are their controlers/feeders. Also when they encounter one another, with a IR scan they check the other robot out to see if they are close in levels, if they are then they will fight each other. The one who wins gains a skill level while the other robot will go down a skill. Pretty amazing stuff for so little components on-board. I've got the Red and Blue one. Reds are mean and nasty and very agressive, Blues are fast and quick. Sooner or later I'll have all four colors, I still need a Green and Yellow one. Still not so sure about this guy. He seems more like a toy, than a real robot. But he comes with enough commands to keep you busy and guessing at what all he could really do. The standing part is due in large to the fact that he stands on two very heavy feet. This is also where the 'D' size batteries are located making it the heaviest area of the plastic robot. You can read up more here about Robosapien. The Robot Store The World's Biggest Selection of Hobby Robots & Supplies! Mondo-tronics' Robot Store Web Catalog features over 400 robot kits, books, and software, as well as Muscle Wires� shape memory alloys, and lots of other great robot related hardware, electronics, video tapes and more! LEGO Mindstorms The Offical site for everything related to the LEGO Mindstorm kits. BEAM Online BEAM robotics is the brain child of Mark W. Tilden. Android World This site is devoted to androids. An android is an anthropomorphic robot - i.e. a robot that looks like a human. Many android developers call their creations "humanoids" rather than androids. We also have robotics links, robot links, animatronics links, and research links. Personal Robotics News Personal Robotics News is a free, monthly text-only newsletter for personal robotics enthusiasts and experimenters around the world. For more than a year now, this free publication has provided monthly Hands On articles, new web sites of interest and free microcontroller code for your robot. Robot Books.com Books on Robotics, Robot Kits, Robotics, and Toy Robots. Robot Kits Electronic hobbyists from beginners to experts can now chose from a variety of computerized robot kits. Our Movit� & Owikit (TM) educational electronic robot kits are available in three skill levels. These terrific robots help children (and adults) learn about the concepts of robotics, sensors, gear drives, electronics, and more. Building these robots are fun and builds self-confidence. And it is fascinating to watch them run! Robotics FAQ This is the Frequently Asked Questions (FAQ) list for the internet robotics newsgroups comp.robotics.misc and comp.robotics.research. This list provides a resource of answers to commonly (and some uncommonly) asked questions regarding robotic systems, organizations, periodicals, and pointers to numerous other resources on the net. Copyright ©2000, Lord Jon Ray - All Rights Reserved.